We’ve pumped up the power! Mytee’s® top-selling flood extractor is more powerful than ever! Introducing the new 7000DX Flood Hog™, an upgrade of our 7000 model. Double the CFM for improved water lift. We’ve added a second 3-stage vacuum motor, increasing the CFM from 115 to 230. The DX also features 144” of water lift. Both upgrades mean increased water suction for faster dry times. Dual power cords and sustained leak-free suction. Each vacuum motor is powered by one of two power cords. The 7000DX can also run on a single cord, providing 115 CFM. A check valve built into the 7000DX closes the non-running motor and prevents air leaks, maintaining full suction by the operating motor. Pumping power – The 7000DX Flood Hog™ discharges a maximum 70 GPM, more than twice that of competing models. Equipment protection, cost and time savings – Only offered by Mytee®. Our exclusive, stainless-steel mesh filter, the Lint Hog™, captures debris before it reaches the pump impeller, preventing damage, downtime and costly repairs. Mounted on top of the machine, it’s easy to access, remove and clean. These accessories, all included – An adjustable flood wand with a scalloped head for carpets and a squeegee head for hard surfaces. Two 25’ hoses, one for intake and one for discharge. Customer service – Mytee® always offers a limited lifetime warranty and network of service centers. 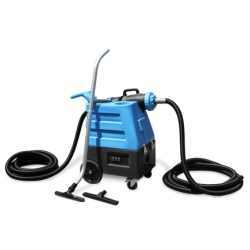 Comes With: Adjustable flood wand with a scalloped head for carpets and a squeegee head for hard surfaces. Two 25’ hoses, one for intake and one for discharge. Machine Dimensions: 28" x 17 1/2" x 36 1/2"
Shipping Dimensions: 29 1/2" x 19 1/2" x 47"